HOUSTON, TEXAS (February 28, 2015) The Houston Baptist University Huskies could not overcome the ArkansasState bats early in the game and dropped the first game of their double header against the Red Wolves by the score of 13-2 at Husky Field in Houston on Saturday, February 28, 2015. With the loss, the Huskies fell to 5-5 on the season. Arkansas State raised their record to 6-3. HBU got on the scoreboard in the first inning on a double by center fielder Zach Nehrir, scoring third baseman Curtis Jones for second base. That would be the Huskies only run until the sixth inning when Jones again scored off another Nehrir hit. After the initial hit by the Huskies, Arkansas State ripped of four runs in the second inning and another five runs in the third to take command of the game. They scored three insurance runs in the eighth inning and added a single run to their tally in the ninth. The Huskies used five pitchers in the loss, with starter Matthew McCollough receiving the loss. The pitched two complete innings; facing 17 batters and giving up seven runs off nine hits. Starting pitch Jon Glidewell was credited with the win, his first of the season. In pitching six full innings, he faced 24 batters and game up two runs off three hits. He threw 76 pitches, with 45 of them strikes. The Huskies will continue their four game weekend series with game three at 2 p.m. on Saturday. They will conclude the series versus Arkansas State with a 2 p.m. game on Sunday, March 1. PHOENIX, ARIZONA (February 20, 2015) The No. 8 ranked Arizona State University Sun Devils were unable to score against the No. 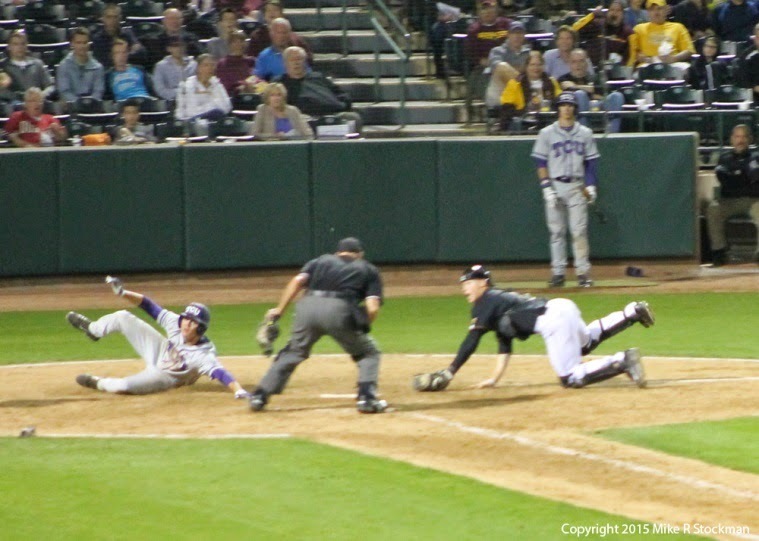 1 ranked Texas Christian University Horned Frogs, losing 3-0 at Phoenix Municipal Stadium in Phoenix, Arizona on Friday, February 20, 2015. The Sun Devils pitching staff are averaging almost ten strike outs per game this year. The Horned Frogs were aggressive with stealing base attempts. Before this game, they were second in the Big 12 with 8 stolen bases. They had 8 attempts, scoring one, but were either thrown or tagged out by Sun Devil catcher Brian Serven on three of the eight attempts. The Sun Devils host the Horned Frogs for two more games this weekend. Game times are Saturday, February 21 at 1:00 P.M. AZ time and Sunday, February 22 at 12:30 P.M. at Phoenix Municipal Stadium. Photo by Michael Wade-Wade Event Photography. BIRMINGHAM, ALABAMA (February 18, 2015)With a jump of 5.88 meters (19 feet, 3.5 inches), Houston Baptist University sophomore Taylor Thomas (shown right) won the long jump at the Southland Conference Indoor Track and Field Championships that concluded on Tuesday, February 17, 2015 in Birmingham, Alabama. Thomas, who hails from Waller, Texas, gave the Huskies their first-ever track title and led the Huskies to eighth place in the women’s team standing with 28 points. Stephen F. Austin won the team title with 132.50 points, followed in second place by Sam Houston with 118 points. Lamar University finished in third with 106 points. Kierstin Santana added eight team points with her second place in the 800-meter run. Her silver medal performance of 2:12.12 was less than a second behind Lamar’s Verity Ockenden first place finish (2:13.09). In addition, HBU sophomore Michelle Chukwujekwu placed sixth in the triple jump (11.58 meters/38 feet, 0 inches). The Huskies also placed two relays in the top eight. The 4 x 400-meter relay consisting of Ericka Rodriguez, Jazmine Warden, Gbemisola Orundami, and Santana were fourth with the time of 3:47.34. The distance medley relay place seventh (12:33.98) with the foursome of Carolyn McClanahan, Roneisha Webb, Stephanie Aguilar, and Santana. In the relay events, the HBU group of Jordan Claypool, D’Anthony Graham, David Hicks, and Brice Christian placed seventh in the 4 x 400 relay. In the distance medley relay, the Huskies finished eighth (10:35.83) with the foursome of Jeremy Lewis, Cody Hammonds, Daniel Shelton, and Juan Fraga.